Killer Mike and El-P are killing it this year. Let's examine what the hip-hop super duo Run The Jewels has done in 2015 after releasing an album that I (and several other critics and music sites) picked as the top release of 2014. Had the Run The Jewels' logo repurposed by Marvel Comics for issues of Deadpool and Howard the Duck, and both of them look awesome. Ripped through killer RTJ2 track "Lie, Cheat, Steal" on Conan to highlight a great day in TV musical appearances. Released the music video for the aformentioned song and it's pretty cool (NSFW language in that video, because RTJ). Gave some really sweet, heartfelt advice to teenage girls in Rookie's "Ask a Grown" series. Teased fans with some short Instagram clips of the wonderfully goofy Meow the Jewels, which will feature sounds from beloved Internet cat Lil Bub. Played a 30-minute set for French video series La Blogotheque. Opened for Jack White at Madison Square Garden (again, NSFW). And that was just in January. We're a few days into February, but Mike and El aren't slowing down, particularly on the adorable front. 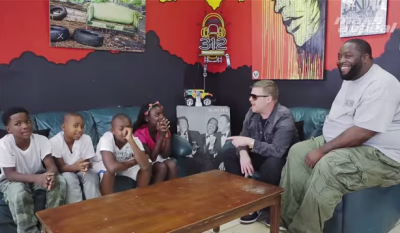 The duo hosted a short conversation at Mike's Graffiti's SWAG Shop in Atlanta with four kids, discussing things from girls vs. boys, marijuana, and female presidents in a video entitled Barbershop Talk Pt. 1. Of course, there's a definite lean toward Mike and El's personal political preferences (go figure), but it's some pretty cute stuff. Also, it's pretty cool to see the duo, who are staunchly pro-pot, preach responsibility when the kids come of age. Then there's Mike's line of "When I get old, I'm probably going to need you guys to have a firm tax base to take care of me, because this music stuff's probably not going to work out," is pretty great when you consider these kids have no clue what any of that means. Something tells me that the music thing is working out, though. Check the video beow and remember to keep running them jewels.